Life's a Beach | Expat Life in Playa del Carmen : Good Eats at Home: Sangrita Anyone? In my opinion (and on this blog it is really the only one that matters) the best way to really enjoy a top quality tequila is with Sangrita as an accompaniment. 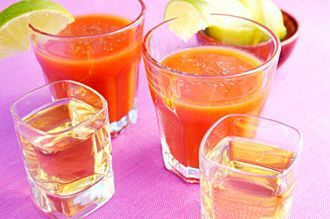 Sangrita, literally, means "little blood" and is the traditional aperitif enjoyed with a good tequila. It is served on the side (mixed together,this is known as a "Vampira") and is sipped alternately as a chaser to sooth the fire of the booze. Since moving to Mexico five years ago, I have had the opportunity to try many wonderful tequilas with just as many wonderful (and some not so wonderful) variations on Sangrita. While you can find it pre-made and bottled in the grocery stores, no self respecting bartender in Mexico will serve the stuff nor do I recommend you drink it.A good bartender will have his own well-guarded secret recipe, that may have been passed down from generation to generation. One evening, at our house in Mystic, Connecticut, a few months before we made the big move to Playa del Carmen, Rob and I cracked open a bottle of Patron Silver and went to work concocting the perfect Sangrita. In all honesty, I have no idea how I was able to keep track of all the variations but when I came to my senses the next morning (or was it afternoon) the chicken scratch that remained in my notebook revealed a damn good house-made Sangrita recipe, one that can just as easily be made in your home kitchen as it can behind the bar in your preferred Mexican watering hole. Combine ingredients, shake well, strain, chill and serve cold with shots of good tequila. In the end, Sangrita should resemble blood, and a dash of grenadine, if you have it on hand, will do the trick. Sangrita can and should be made to suit your particular taste. It can be made quite spicy or, if you like it a bit sweeter, add a bit of grenadine syrup or more orange juice. Then settle in with friends and a selection of your favorite tequilas and enjoy an authentic Mexican experience! Ohh I looove tequila, but I have to say I'm not a huge fan of Sangrita.... Like you said it's your blog so I guess it doesn't matter, LOL!!!! In Canada we would drink our tequila with Clamato Juice. Yes, sounds strange, but their clamato is SO different than that in the US and Mexico. Bottle looks identical, but SUCH a different taste. Anyways, when I can I get some friends to bring it down so that I can have a shot glass of tequila, and a shot glass of my Cdn clamato - delicious! LOL! Is there any place in Playa you know Michele that serves a decent sangria?? Can't remember the last time I saw it on anyones drink menu! You know, I am actually not a fan of sangria (gives me wicked hangovers) so I never think to look. I'll keep my eyes open now. Maybe we should ask your parents to come up with a signature sangria recipe for the restaurant!! That would be the best.. though, knowing how fiercely "Romano" Mario is I don't think he would allow it lol!